Since Little Brother loves just about anything that “goes”, we decided a Thomas The Train Birthday Party would be the perfect choice to celebrate his 3rd birthday. I did a lot of planning and searching for ideas, and I’m sharing them here, so you can easily plan a Thomas the Train Birthday Party too. Let’s get planning! Scroll on for more details! The first thing our guests saw at our Thomas the Train Birthday Party was Thomas on the Track on our front sidewalk.I found the idea for the “3 YR OLD CROSSING” sign and duct tape tracks both on Pinterest. The tracks take a lot more duct tape than you might think. We had to use some silver duct tape we had already to finish it. It looks much better with all black, so I would suggest measuring before you buy your tape! I thought about making a big Thomas or cardboard train like this one, but then I found the Thomas tent on Amazon. MUCH easier! I made a “Birthday Crossing” sign for the front door. This idea came from this pin, but I decided to change it to “Birthday Crossing”. I got the “Arrivals” and “Departures” idea from this party. I found the engineer hats, bandanas, and treat bags all on Amazon. The leftover engineer hats were great when we went to “A Day Out With Thomas” later in the month! Inside the bags were Thomas the Train stickers, party favors, and dollar store bubbles. What party is complete without a cool snack and train table? I’m bummed that I didn’t get a better picture of the cake and snacks table, because it was really cute! 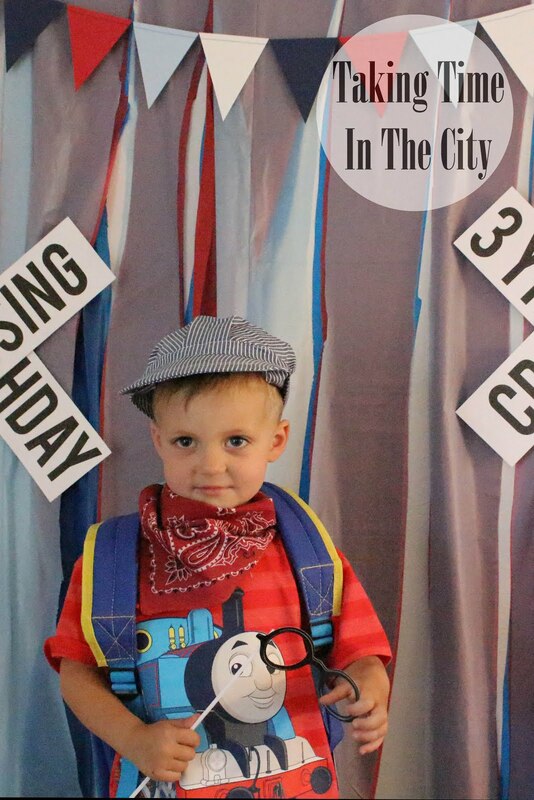 It was the “cherry on top” for our Thomas the Train Birthday Party. Up at the top you can just barely see the flag bunting I made. I also made the clouds that were hanging in front of the Thomas backdrop. On the table and pulled by Thomas, we had snacks in “cars” that were disposable foil pans. The train was sitting on a “track” table runner that I found on Amazon. We had produce cars (fruits and veggies), a lumber car (pretzel sticks), a coal car (olives), and a cotton car (kettle corn). Attached to the front of the table is a bunting sign I made that reads “All Aboard”. Here’s the inspiration for the cake and snacks table. A closer view of the cake. This cake was the inspiration for our Thomas the Train cake. I love this White Almond Sour Cream Cake for all our birthday cakes and found this recipe for the Crusting Cream Cheese frosting that was absolutely fantastic. The Thomas toy is from Amazon. I love a good photo booth! The backdrop is just plastic table covers from the dollar store that I layered, attached to the wall, and then cut in to strips almost to the top. After I had the table covers attached to the wall, I added the bunting and signs that I had made. …and we had fun taking pictures! I also made these train race boxes, but we totally forgot to play with them during the party! The boys did play with them the day before the party, though, and had a blast. They were inspired from these boxes. I had so much fun putting it all together. Little Brother must have enjoyed the party too, because he was already asking about his next birthday party a couple days later! For more ideas, visit my Train Birthday Party Pinterest board. Follow Erin’s board Train Birthday Party on Pinterest. Any links to products in this post are just there to help you find the products. I’m not receiving any compensation by posting them. I’m a mom to two wonderful boys. Though I grew up in a “girl” household, I have fully embraced and love ” Our Boy Life”. Read more about me and my family on our About page.